Who is Smarter: Romney or Obama? President Obama has a clear lead among Internet users when we asked the question "Which Candidate for President do you think has the higher IQ?" Respondents selected Obama over Governor Romney by a 3-1 margin, 74-26 percent. Strangely, 27 percent of people who chose Obama said it is because he graduated from Harvard, seemingly unaware that Romney also graduated from Harvard. To control for this, we conducted another survey that prefaced the earlier question with: "Knowing that Obama obtained a JD from Harvard and Romney obtained a JD/MBA from Harvard…"
When the group knew about both candidates' Harvard backgrounds, the results were closer, with Obama edging Romney by a 3-2 margin, 60-40 percent. One commentor who picked Romney said: "Getting both a JD and an MBA seems like it would take a lot of brain power." In our survey to gauge perception of the Vice Presidential candidates, one respondent claimed: "Ryan seems a lot smarter than Obama and Biden combined." But in the end, the Democratic ticket has the highest perceived IQ, with Biden leading Ryan almost 2-1 at 64-34 percent. What do you think? Take the poll and let us know which candidates you think have the highest IQ. And let us know your opinion with a comment below. 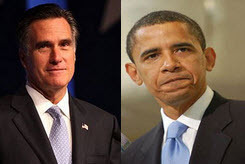 4 Responses to Who is Smarter: Romney or Obama? Obama gets the best grade for teleprompter reader – but it’s clear that Romney is smarter. I think these results are exactly right. Obama must have the higher IQ. He uses a lot of big words that just sound smart. Thanks for your grateful informations, this blogs will be really help for students news. If President Obama is so smart, why did he need affirmative action to get into Columbia and Harvard, as well as the Harvard Law Review (Likewise, Michelle Obama would not have gotten into a decent college if not for affirmative action). Why couldn’t they make it on their own. (Obama’s college grades were also unimpressive. He was a C student). Leave a Reply to Jeremy Click here to cancel reply.